If you know you want to start offering Medicaid advice to your clients but also know you need help, please click here to learn about our unique Medicaid mentoring/support services. Do you know what a Medicaid compliant annuity is? If you are like 95% or more of the industry, you don’t know why and when you would use one to help your clients. Since it is IMPOSSIBLE to give complete estate or financial planning advice without knowing what one is, this should be a very important newsletter for most readers. Why don’t most advisors know about Medicaid annuities? When the Deficit Reduction Act (DRA) was finally enacted in 2006, it severely curtailed the ability to use Medicaid annuities. Additionally, even when these annuities were more useful, only a handful of insurance companies offered them. Finally, besides Medicaid Planning Course course (which is taught by Mike Anthony of www.MedicaidPlanning.org), there is no one that provides detail educational and support on Medicaid planning using annuities. -It must be irrevocable and non-assignable; -It is actuarially sound; -It must provide for payments in equal amounts, with no deferral and no balloon payments; and -It must name the state Medicaid Program as the primary beneficiary to the extent that medical assistance benefits were provided to the institutionalized individual (certain exceptions may apply). When a senior client is getting ready to enter a nursing home, the question then becomes, “How can he/she receive financial aid?” The way to receive financial aid is to have no assets or the “right” assets. The wrong assets are stocks, mutual funds, CDs, money market accounts, and, yes, IRA or qualified plan money. Married couples who have more than $109,560 of the above-listed “countable” assets are not going to receive aid until they “spend down” their assets to meet these minimums. Guess what is NOT a countable asset? 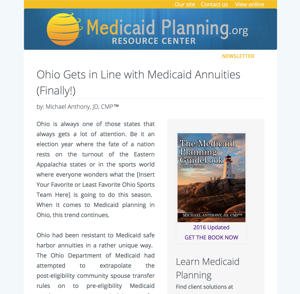 Properly used/structured Medicaid annuities. 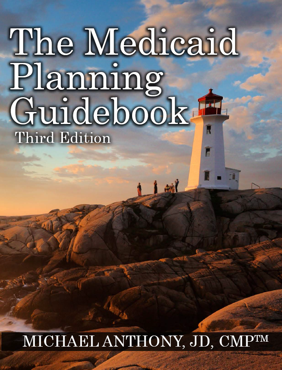 Therefore, for many clients, Medicaid planning will consist of repositioning countable assets into properly structured Medicaid annuities so they can then become eligible for Medicaid benefits. Until recently, it was thought by many that the spouse staying in the marital residence had to impoverish him/herself in order for the nursing homebound spouse to receive aid. In July 2009, a state Circuit Court of Appeals case sided with the Department of Jobs and Family Services (agency that handles Medicaid services). The Court of Appeals confirmed what the Federal Law said which was that monies in the family’s combined asset base can be used for an income annuity for the “well spouse” (non-nursing homebound spouse) as long as it follows the statutory guidelines (stated above). Even if these monies are greater than the asset allocation for the well spouse, if you follow the Medicaid Compliant rules, the annuity is OK.
What does this mean? It means that couples will be able to reposition tens if not hundreds of thousands of dollars into Medicaid annuities and NOT have the income from the annuities count against the aid a nursing homebound spouse can receive. In other words, this is a big deal for clients and a HUGE opportunity for advisors (because virtually no advisors know what you are reading in this newsletter). Having the ability to write single and flexible premium deferred annuities that are convertible to SPIAs with no surrender charges is NIRVANA for advisors with senior clients!